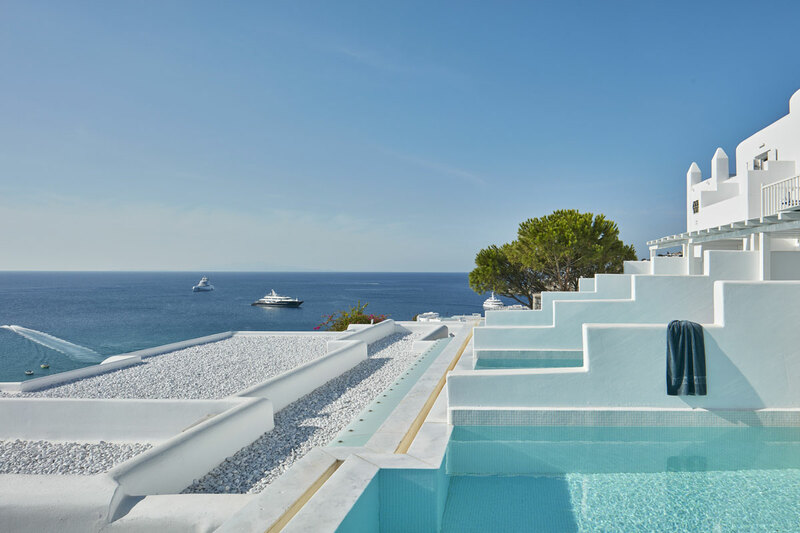 The Myconian collection is a homegrown and family-owned hospitality empire that includes nine of the leading luxury hotels on Mykonos, among which three distinguished Relais & Chateaux, two “Leading Hotels of the World” members and a Design Hotel. There is something about a family business, and its unique synthesis of heritage, loyalty and emotion, that captures the essence of luxury and accounts for the strength of some of the world’s great portfolios. 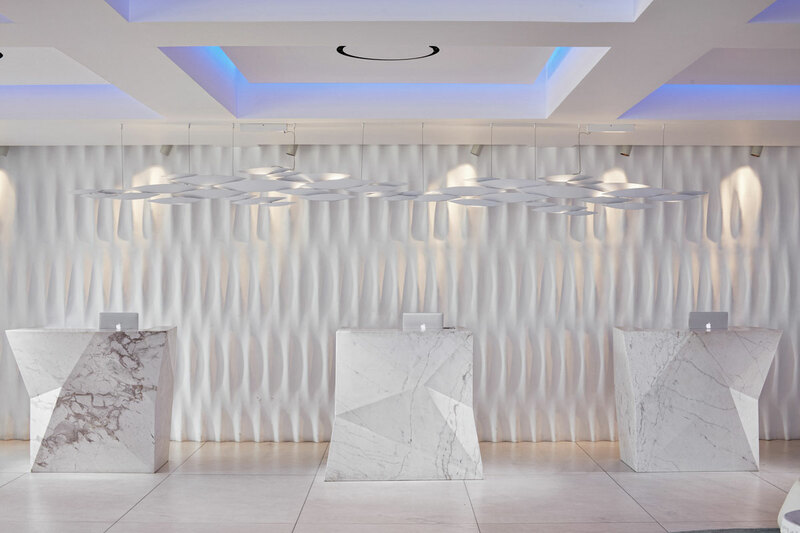 This quality is at the heart of the Myconian Collection’s success. Built in 1992, the Myconian Ambassador, was the very first luxury establishment of its kind on the island and was award edits five stars immediately on opening. The Myconian Ambassador underwent a transformation in 2015under the guidance of international architect Galal Mahmoud, President of GM Architects, and recipient in the same year of the prestigious Architectural Review MIPIM Future Projects Award in Cannes for his “Museum of Civilizations”. The Ambassador is a luxury hotel in Mykonos, capturing the essence of Myconian charm and the celebrated ‘art de vivre’ of Relais & Châteaux. 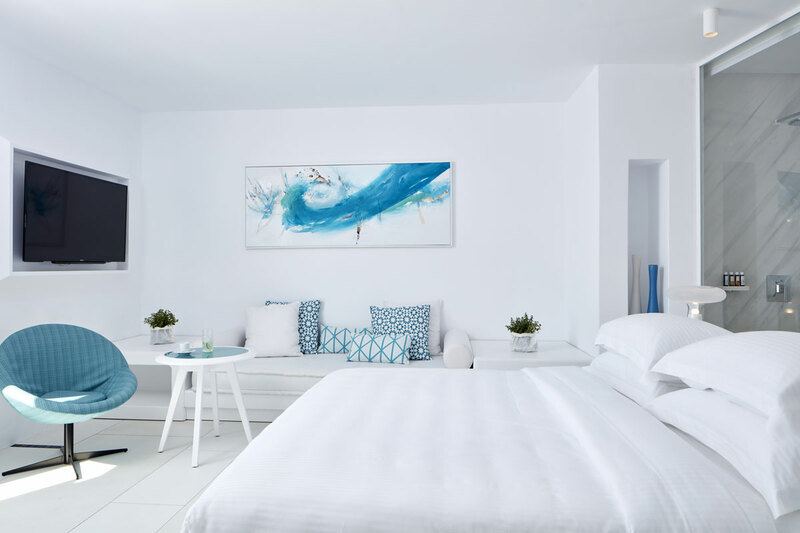 Mere steps from the fine sand of Platis Gialos, and built in sympathy with the slope, its architecture blends contemporary chic with tones and textures borrowed from the local vernacular. 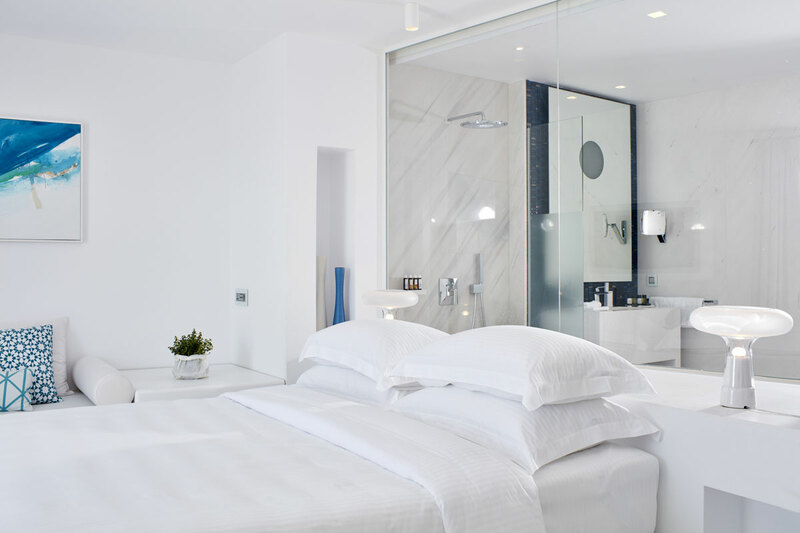 Interiors that embody the clean line and cool sophistication of high design flow into the quiet comfort of luxurious bedrooms, or spill out onto the spectacular terrace that is the heart of the hotel, all without ever breaking the spell of magnificent Aegean views. 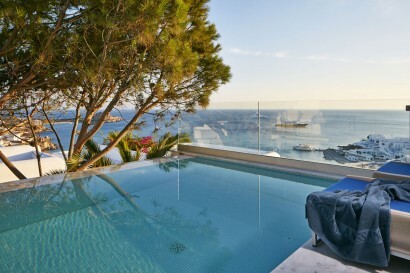 The Myconian Ambassador is situated just above Platis Gialos beach on the south coast of the island, renowned for its crystal water and fine sands. The famous beaches of cosmopolitan Psarou, picturesque Paranga and Agia Anna are within easy walking distance. The idyllic calm of Platis Gialos bay belies its proximity to Chora – also known as Mykonos Town – a mere five kilometres (three miles) from the Ambassador. All waste is recycled, and linen that does not meet Relais & Châteaux standards is donated to oldage homes, prisons and monasteries. Our managerial philosophy and daily operational approach reflect our dedication to the island, through environmental conservation initiatives, local sourcing and consistent support to the Cycladici sland communities. 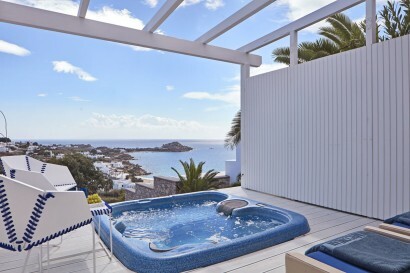 Thalassa Suite with Private Pool. Azure Suite with Private Jacuzzi. 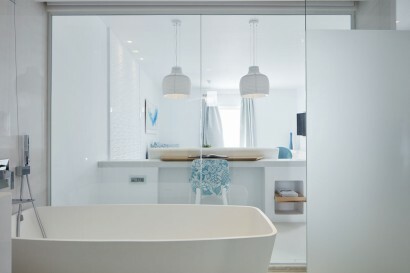 True White Suite with Private Jacuzzi. Sea Breeze Side Sea View rooms. 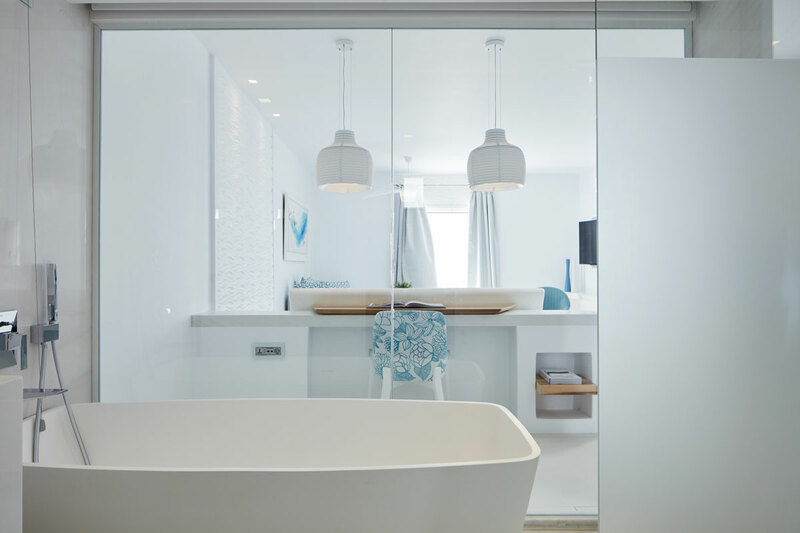 True Blue Panoramic Sea View rooms. True Blue rooms with Outdoor Jacuzzi. White Bliss Sea View rooms. 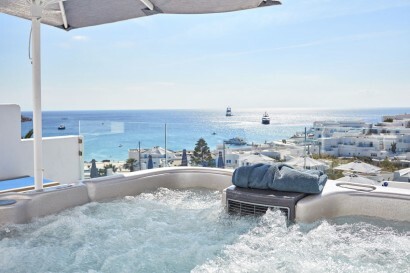 White Bliss rooms with Private Jacuzzi. 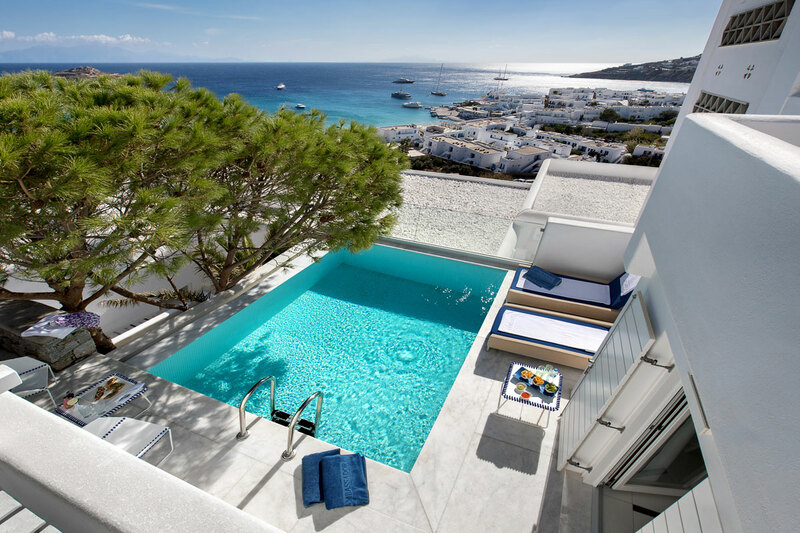 White Bliss rooms with Private Pool. Two bedroom Villa with Private Pool. 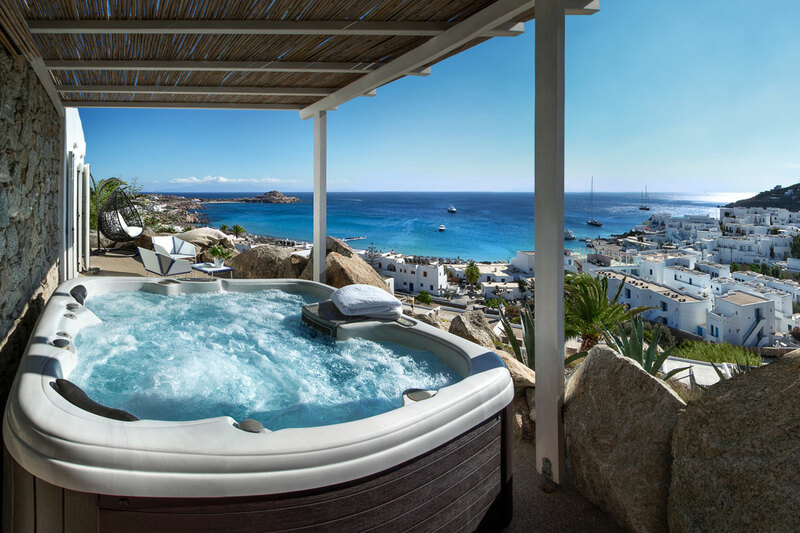 Two bedroom Villa with private Jacuzzi. Three bedroom Villa with Private Pool. Four bedroom Villa with Private Pool and Jacuzzi. PlatisGialos eight bedroom Villa with Private Pool and Jacuzzi. 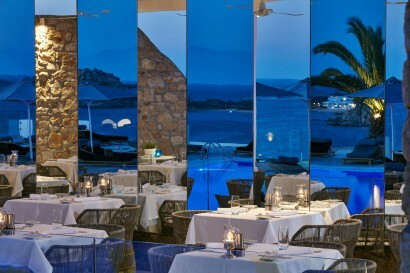 Our restaurant is sheltered from the evening breeze in an alcove of rough-hewn stone. 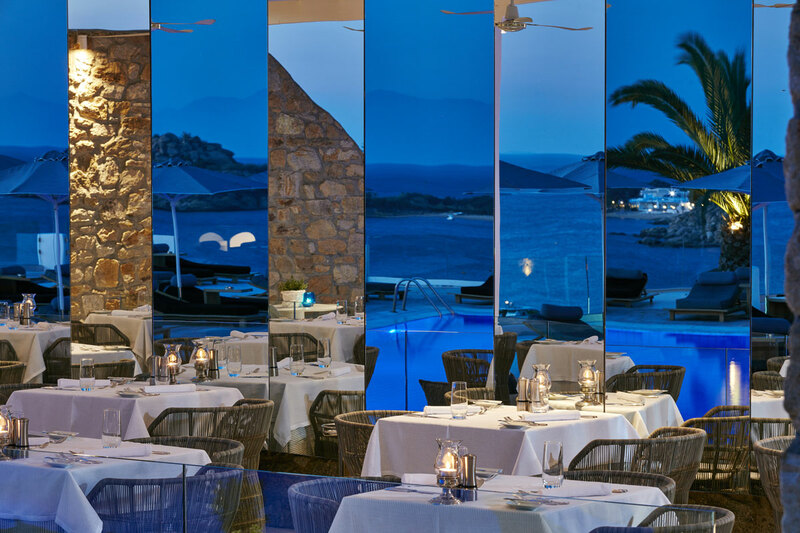 As one of the top tables on the island, Efisia offers a gourmet menu in the Relais& Châteaux tradition, pairing a culinary experience with luxurious atmosphere. With its panoramic view of the entertainment terrace, George’s is an ideal meeting spot and a perfect vantage point from which to watch the day’s rhythms unfold. Awaiting your discovery, our Thalasso Spa is an oasis of relaxation and rejuvenation for body and soul. One of our experienced professionals will guide you through the therapeutic benefits of four pools – each maintained at different temperatures and salinity, complemented by essential oils and hydromassage. These facilities are complemented by a steam room, sauna, and a range of treatments offered in our single or double therapy rooms. Select an experience in pure indulgence from a menu of spa classics, or a combination personalized to your needs by our masseurs and beauticians, whose expertise in using a range of award-winning anti-ageing and beauty products will bring your body and mind into perfect equilibrium. The spacious, light-filled fitness centre is equipped with the latest in cardio vascular and weight training machinery. We offer group sessions either indoors or outdoors, with an emphasis on special settings such as secret sunrise yoga or yoga by full-moon, as well as private sunset sessions pairedwithmeditation. Water yoga ismost effective for injuries and delicate joints. Fully equipped with reformers, combo chairs and other Pilates-specific equipment.